Anglers are required to use circle hooks in some fishing tournaments because they are less likely to cause lethal injuries in billfish, such as marlin. However, research from North Carolina State University shows that broadening circle hook requirements could adversely impact charter and recreational fishing, since they make it more difficult to catch non-billfish. "We wanted to know whether circle hooks are effective as conventional J hooks when angling for non-billfish -- such as yellowfin tuna -- in North Carolina waters," says Paul Rudershausen, a research assistant in NC State's biology department and lead author of a paper describing the research. The NC State team worked with charter boat captains and mates who were experienced with use of circle hooks to look at the efficacy of circle hooks versus J hooks when trolling offshore with rod and reel. The findings are relevant for similar fishing efforts in other waters where these same species occur. A "circle hook" is defined as a circular hook in which the point of the hook is perpendicular to -- and aligned with -- the shank of the hook. This differs from a J hook, which is shaped like the letter J. Studies have found that circle hooks are less likely to mortally wound billfish during recreational or charter fishing. As a result, the National Marine Fisheries Service instituted regulations requiring anglers in Atlantic billfish tournaments to use circle hooks when using natural baits. 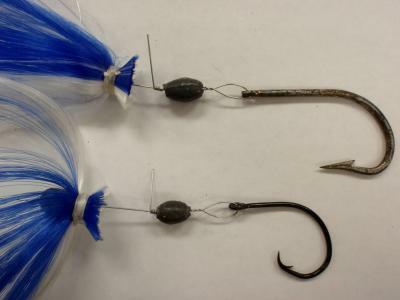 J hooks are still permitted if an angler is using purely artificial bait. Anglers and fishing industry observers have speculated about the possibility that circle hook regulations may be expanded to fishing outside of billfish tournaments -- even when anglers are not fishing for billfish -- to protect billfish species that may be caught inadvertently. This speculation led NC State researchers to determine whether circle hooks would be as effective as J hooks when fishing for non-billfish species. The answer is no. The researchers looked at the relative effectiveness of circle and J hooks for three popular sporting fish: dolphinfish (often called mahi mahi in the Pacific), yellowfin tuna and wahoo. "Circle hooks were roughly 60 to 70 percent as effective at catching these three species as J hooks," Rudershausen says. The researchers found that the fish would still strike at the bait, but that the hook was significantly less likely to set in the mouth of the fish. However, when the hook did set, anglers were just as likely to be able to get the fish to the boat. "The charter ocean fishing industry is economically significant in North Carolina," Rudershausen says, "receiving approximately $65 million in for-hire fees in 2009. The concern is that circle hooks would drive down catch rates -- which could result in fewer clientele for North Carolina's offshore charter fishing industry." The researchers hope to work with economists to better capture the potential economic impact of any expansion of circle hook regulations.